I put the UND in just to draw attention to it. There's a fair bit of emphasis, naturally, on it. It's all about the joining. Which reminds me (I seem to be getting to that age) of a schools Verse Speaking Competition. The set piece was called "Black and White" and I was marked down for emphasising the 'AND' as I announced the work before starting off : "I met a man along the road ..." Adjudicators be blowed. And is a pretty important word. Well, no markdowns here for the and and ands. 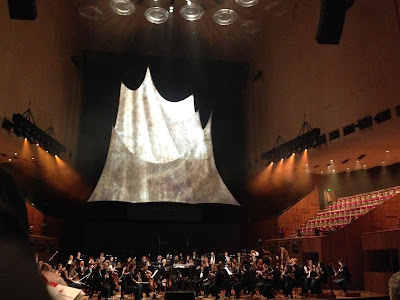 It's a huge undertaking, mounting Tristan and Isolde, and the Sydney Symphony did a splendid job. It's not a matter of being grateful for small mercies, as in doing it at all, but in succeeding so well. Mind you, I think they should. Do opera in the concert hall I mean. 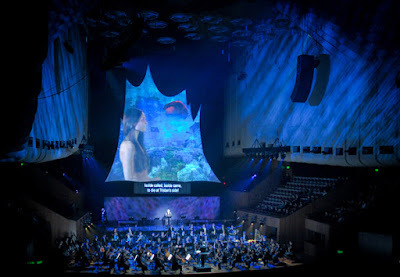 After all, it was the orchestra in its previous ABC life that shunted the opera out of the big (now Concert) hall, dual purpose admittedly, into the then Drama Theatre, now the Joan Sutherland Opera Theatre. That's faint praise. She didn't like it and neither does anybody else. The Concert Hall looked very impressive. The acoustics rings were pulled up high and the vastness of the space, an acoustic nightmare, was even more apparent. The rear projection screen was a morphed sail x parting proscenium curtains arrangement. The lighting was wonderful, quite stylish. The concert platform was stuffed with players, and the singers sang from behind the orchestra on an elevated platform, below the big screen, with their own rear screen (the black space in the photo above) which served as a sound board and for some lovely soft abstract lighting effects. That they carried so well across the orchestra (despite some criticisms I've heard) is a credit to this sensibly placed backing, themselves, bless them all, and David Robertson who managed the forces at work, and their balance, brilliantly. I thought, thought I. 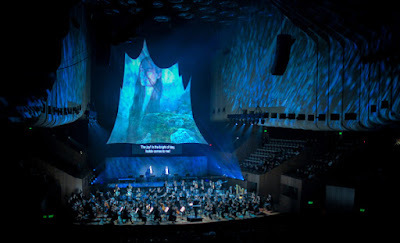 S Katy Tucker, from New York, whose projections for The Flying Dutchman were so beautifully evocative, was here again. How hard is it to do projections for Tristan? Really hard. Whereas she had focused on the sea and facial closeups in Dutchman, using footage from off Bondi, and Eric Owens astoundingly beautiful eyes, and kept things pretty abstract, I don't think she was quite so successful this time round. Perhaps she had intended to use the singers faces, especially the eyes, the windows, who knows, but the cast changes would have precluded that anyway. The step into literalism with various Adam and Eve like images of idyllic almost teenage gooey love smitten faces and figures in various stages of rapture was a step too far. For me. But this is evolution of the art form, and I am totally supportive. The fine line between emphasising the text and music and distracting from it is a very fine line indeed. I've seen a semi-staged Ring (Budapest) where the projections were sometimes overwhelmingly moving and sometimes clunky. It is as individual as any production decisions and I welcome more. Like a Lohengrin. Robertson and his orchestra deserve great praise. The sound was good, for this hall. The balance was excellent. The detail was there, and the sweep never lost. And the soloists were delicious, especially Tobias Breider's gorgeous viola number. While I might have wished for more indulgence and some goose bumps in the Act 2 duets, like the most beautiful moment of the whole work, the call for the night, O sink hernieder, nothing prepared me for the closing bars where he let them rip in (cliche warning) waves of emotion so strong as to overpower, appropriately, the formidable Isolde of Christine Brewer, drowning here to death in a wondrous outpouring of sound. Christine Brewer, a mature and experienced Isolde, was a noble stately princess bride lover doomed. I had reservations (she's been here twice) that were swept aside with the sheer stamina, the sheer will power, the lovely middle voice and the every word. Lance Ryan stepped in for Stuart Skelton who withdrew because of delayed preparation. He needed a potion or some healer. That was a huge disappointment - to not hear his role debut (now to be Baden-Baden before Berlin, London and the Met) in his home city before his home crowd. Ryan we'd heard in Milan in the Siegfried Siegfried and, well, it wasn't much to my liking. But what could be a nasal timbre here was delivered as steel, a bit pitchy wobbly under pressure notwithstanding, effectively broken by his submission to the sword (his guilt, in my book). Stamina again carried the day, or night, or whatever page of Schopenhauer you're on at the moment. Especially wonderful was Katarina Karnéus' Bragane, with gorgeous voice, emotionally committed, here, there, everywhere, warning, warning. Sadly I missed her Nuits d'été. I'd have gone back just for her if I could. Kurwneal, that's another big sing, was in good hands with Boaz Daniel and then came Uncle Marke - well, thank you John Relyea, another short notice step-in. A Met stalwart and a world-stage bass here at short notice was rich pickings and he was fabulous. Angus Wood (Melot) and Harrison Collins (Steersman) and the men of the Sydney Phil Choir were worthy locals, and the Canadian John Tessier a bright beautiful young sailor and shepherd of almost unnerving accuracy. It cost a fortune and I hope the exclamations and praise, and financial support, and the satisfaction of achievement and success, will keep the momentum. Sydney needs this, especially the major works which simply can't fit into the little black box. Waiting for transport home we heard that the reason the first few rows thinned out as the night progressed was that from them one could not see the singers, nor the subtitles. People either left or tried to move back to other seating. That's an issue needing attention, or appropriate pricing. Peter McCallum's rave is here. Margaret Throsby interviews Christine Brewer here. Really touching.